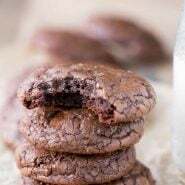 This brownie cookie recipe is all of the good parts of a brownie- crackly crust, fudgy middles, chewy edges, & intense chocolate flavor -in one easy, homemade cookie recipe. One of the best cookie recipes around! I have some amazing, chocolaty goodness for you today! 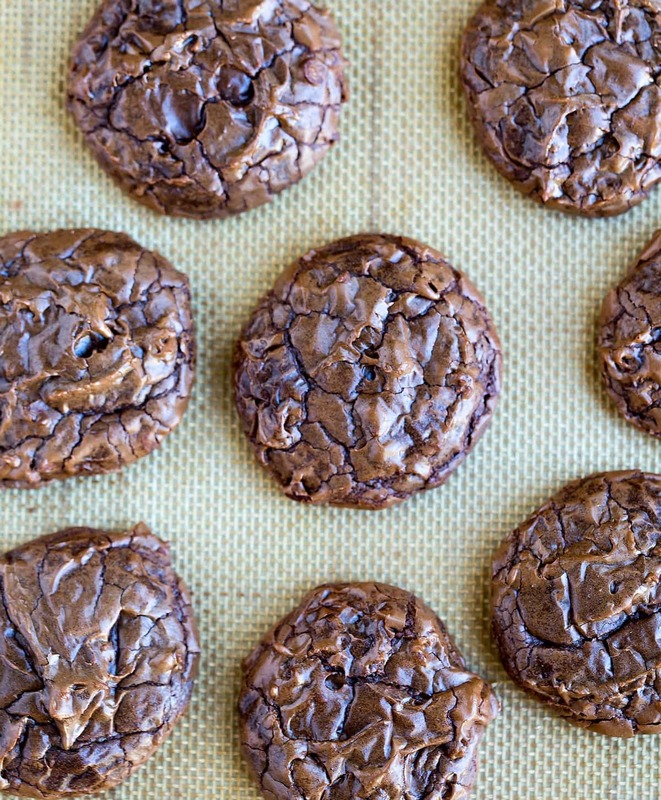 These Brownie Cookies are for serious chocolate lovers. 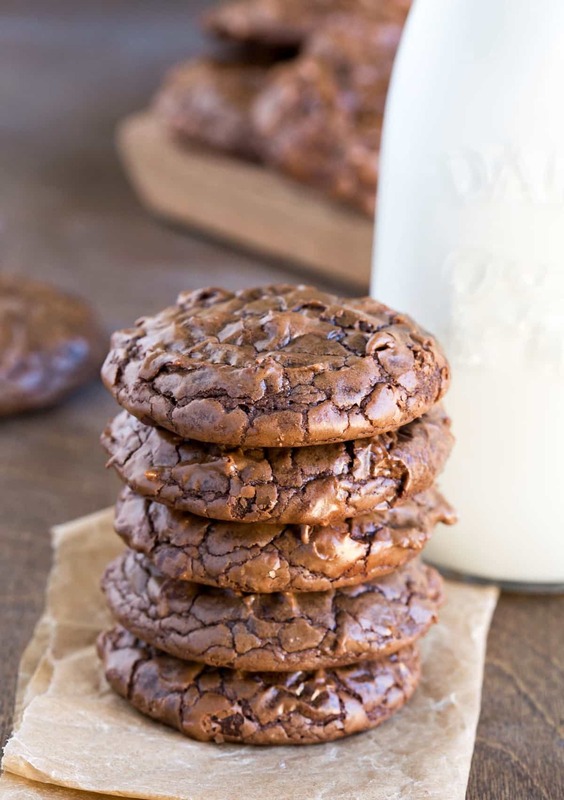 They’re similar to my Flourless Fudge Cookies, the one of the most popular cookie recipes on my site, but this easy cookie recipe makes chocolate cookies that are thicker and richer. 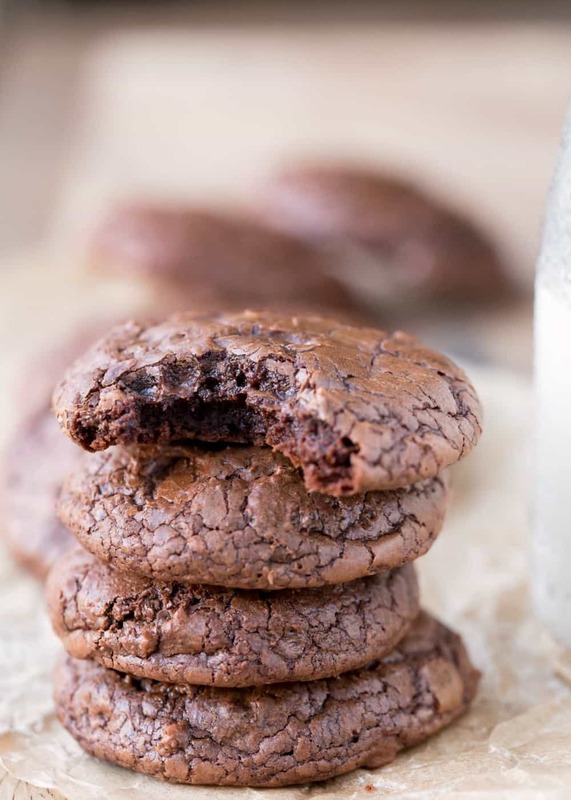 This homemade brownie cookie recipe is pretty simple to make and give you all of the good parts of a brownie – shiny, crackly crust, fudgy middles, chewy edges, and intense chocolate flavor – in one little cookie. When you read the recipe, you may be tempted to cut short the mixing time. Don’t do it! The cookies need the extended mixing time. It’s going to make all the difference in your cookies turning out right. So please take the few extra minutes to make it as written. And…..then enjoy the most ridiculously rich and fudgy, best homemade cookies ever! If you love brownies, please take a moment to check out my how-to make homemade brownies guide! Or check out my Brookie recipe that combines these cookies with chewy chocolate chip cookies! Cookie Scoop: This is the cookie scoop I have. I use it so much that I bought a second one. It’s great for scooping cookies, mini muffins, and even meatballs. Parchment paper: I buy a giant roll of parchment paper, and I use it regularly to line pans. I also use it underneath baking racks to catch drips when I’m putting on glaze or icing. 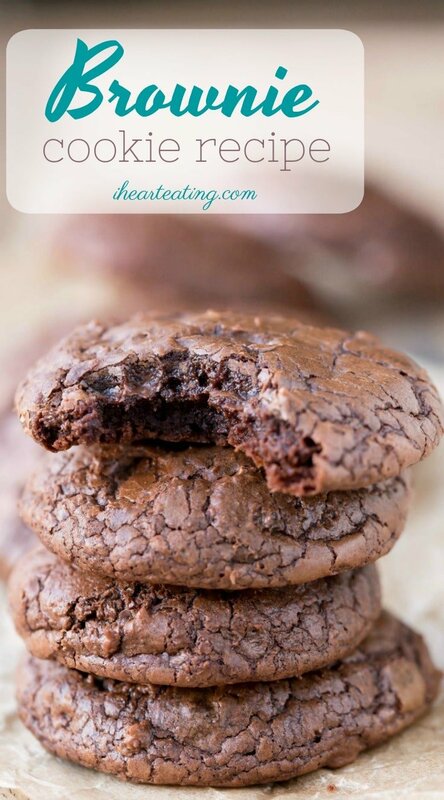 If you’ve tried this brownie cookie recipe, don’t forget to rate the recipe and leave me a comment below. I love to hear from people who’ve made my recipes! You can SUBSCRIBE to receive my latest recipe newsletters or FOLLOW ME on FACEBOOK, INSTAGRAM and PINTEREST for even more delicious food. 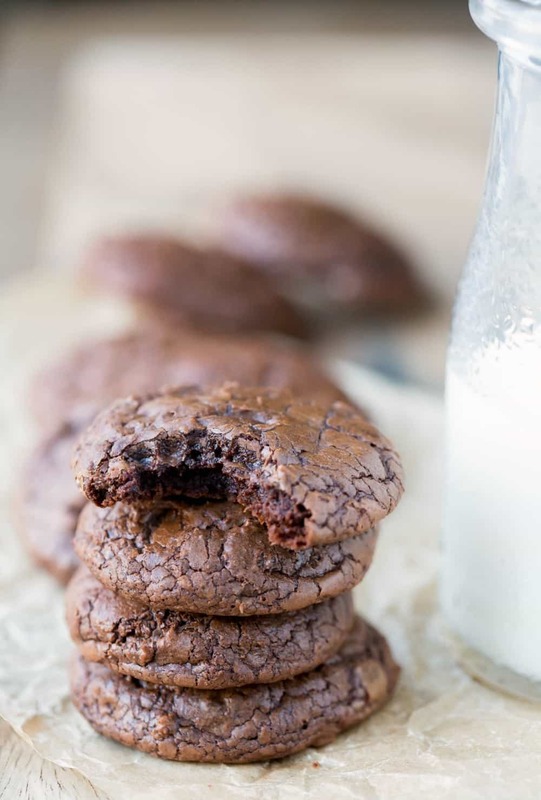 This brownie cookie recipe is all of the good parts of a brownie- crackly crust, fudgy middles, chewy edges, & intense chocolate flavor -in one little cookie! Also, if check out the how-to video right above the recipe. Melt bittersweet chocolate chips and butter in a heavy saucepan over low heat, stirring constantly until melted and well-combined. Remove from heat, and set aside. In the bowl of a stand mixer, beat the eggs, sugars, vanilla, baking powder, and salt on high speed 5 minutes, or until the batter is thick and creamy. This step is key, so make sure to beat the mixture for the full 5 minutes. Reduce the speed to low, and mix in the melted chocolate until well-combined. Stir in flour and cocoa powder just until combined. Add nuts, if using, and mini chocolate chips. Stir in to combine. The batter should be the consistency of a thick brownie batter at this point. Cover the batter, and chill for 30 minutes. Preheat oven to 350 F. Line two baking sheets with parchment paper. Using a 1.5 tablespoon cookie scoop, drop batter onto the prepared cookie sheets about 2 inches apart. Bake cookies 8-10 minutes. The cookie will look set at the edges but still be a little wet looking in the center. Don't overbake, or the cookies won't be crackly and fudgy. The shiny, crackly crust will develop as the cookies cool on the baking sheet. I didn’t see where the butter was added in the instructions? Do you beat it for 5 minutes with the eggs? Hi! The butter is melted with the chocolate chips in step 1. Could you use different chocolate? I only have unsweetened chocolate and milk chocolate chips but I do have the cocoa powder. Thank you! OMG!!! I’m in love with these cookies!!! ? They are ridiculously good. Thanks for sharing the recipe! I followed the recipe and the cookies were perfect. they look just like the pictures! Thanks for the delish recipe! I haven’t tried to freeze them. I would guess that they would work out ok, but I haven’t tried it to say for sure. Was very excited to test out this recipe as they looked delicious from your pictures. They taste great but sadly turned out flat as ****. why? they didnt even crisp up like the photo. Hi! I’m sorry that you were disappointed, but the cookies shouldn’t be crispy. If you’ll notice the description, it says that the cookies are fudgy in the middle and chewy at the edges. Also, if your cookies were flat is was probably because you didn’t beat the egg mixture long enough. Without beating enough air into it, you won’t have the volume or the shiny exterior. Can you use wheat flour instead of all purpose? I’ve never tried to use whole wheat flour in these cookies, so I’m afraid I can’t tell you how it will work. Unbelievably delish! I don’t have a stand mixer (or any electric mixer) so I mixed by hand with a wire whisk for about 15 or 20 minutes. I used semi-sweet chocolate morsels and completely forgot to add the mini chocolate chips but they turned out just like the pictures and were even better than the chocolatey taste of heaven I was hoping for. Thank you, thank you, thank you for this recipe!!! I’m eating your cookies right now over here in Germany and I just can’t stop! I guess I’m addicted – they are incredibly tasty. Turned out exactly as you described! Thank you for sharing your recipe, definitely coming back here! I made these cookies and they are amazing! I didn’t use nuts, I just added more chocolate chips. Thanks for the recipe! Thank you! I’m so glad you enjoyed the cookies! More chocolate is never a bad thing. ;) Thank you for commenting! One more quick question: Will using “Dutch-Processed” cocoa make a big difference? I use unsweetened cocoa powder because it helps tone down some of the sweetness in the cookie. I haven’t tried baking these cookies with Dutch-processed cocoa powder, but if you’re using Dutch-processed cocoa powder and semisweet chocolate chips, your cookies will end up sweeter than the originals. These cookies look great and I can’t wait to make them! But I want them to turn out looking just like yours. Soooo, I have either Bittersweet (60-70% cacao) Chocolate baking bar or Semi-Sweet Chocolate Chips (can’t find Bittersweet Chocolate Chips). Which will be better to use to get the “look” of yours? I know that chips have a lot of other stuff in them that may be contributing to the texture and look of your cookie, but I’m not positive. Hi! Thank you! I use chocolate chips rather than baking chocolate bars because of cost (for me, it’s $3 for the chocolate chips vs. $7 for the bars). The quality of the chocolate chips is going to make a difference. If they’re a good chocolate chip (i.e. Ghirardelli), then the semisweet should be ok. You will end up with a sweeter cookie though. Really, a lot of the look of the cookie (the sheen and crackly exterior) comes from step 3. I hope that helps! Can the baked cookies be frozen and served two weeks later? I made these a few weeks ago and they turned out great! So delicious! Thank you for sharing this recipe. Also, has anyone tried using milk chocolate chips? Thank you! I’m glad you liked them! =) I’ve heard from people who have used milk chocolate chips in place of the mini semisweet chocolate chips. I’m not sure that I’ve heard anything back from someone who has used milk chocolate chips in place of the bittersweet chocolate. If you try it, I’d love to hear how it turns out! Perfect chocolate cookies! I left the nuts out. They look just like the pictures and taste SO good!! These cookies are excellent! I added a bit of espresso powder & added the Ghiradelli salted caramel chips to about half of the batter – so so good! I have a feeling that I will be making these a lot. Thanks! Thank you so much! Those sound like tasty additions. =) Thanks for coming back to comment! This didn’t work for me at all. I followed instructions but my cookies are now a giant brownie on a massive cookie sheet because they melted together. This really bites. Second recipe I have had turn to crap on me today and I need this for something important. So back to the store to start over. I also burned the SHIZNIT out of my toe with chocolate from the cookies. I can’t blame your recipe entirely, if at all, because there have been several wtfs in my kitchen today. So, you get a 4. I hate those days! It seems like some days, nothings comes out right (maybe it’s the weather?). Well, I hope your toe feels better and that you had something work out for you. If you’d like to troubleshoot when you have more time, please let me know! Hi, the recipe is very nice i tried it with unsweetened semi chocolate to melt, however when i changed it to bittersweet chocolate i am not getting the same results the cracky surface and it was flat. I don’t know what is wrong with the type of chocolate? And what to do to fix it? What type of bittersweet chocolate are you using? Did you make any other changes? If you choose not to use the nuts do you need to add extra flour so that they aren’t flat? I know that’s what regular cookie recipes recommend. Nope! I’ve made these cookies without nuts and without mini chocolate chips. They came out the same regardless of whether or not I included the add-ins. Iam not sure where I went wrong althought I might have an idea. Could you tell me how many cups of chocolate chips are the 12oz of chocolate it needs at the beginning of the recipe. I looked on google but I dont know if it was the way to go lol. I’m not sure! I weigh the chocolate chips when I add them. I’m happy to help you troubleshoot. Can I ask how thick your batter was when it went into the fridge?